I had a birthday cake to make for a friend and given free rein to make what I thought fit, I was in the mood to create a salted caramel cake. A once unfamiliar concept on British shores, it seems to have taken the nation by storm and is now everyone’s favourite flavour – it’s certainly one of mine. I’ve made a few salted caramel bakes but so far only one full on salted caramel cake. It was delicious and went down a storm at the Clandestine Cake Club meeting. I keep promising myself I will make it again. However I wanted to try something a bit different this time and had visions of salted caramel splashed over a cake and dripping down the sides. For the base, I envisaged a rich chocolate cake with a slightly salty caramel flavour filled and covered with a rich and creamy salty chocolate icing. So this is what I did. All went according to plan. I didn’t get to try the cake, but the reports back were positive. Lashings of salted caramel and chocolate stars seemed to do the trick. The only course open to me is to make it again one day so I can try it for myself – it’s a hard life. A rich dark chocolate cake filled and covered with a whipped creamy salty chocolate icing then topped with salted caramel. Place a heavy bottomed pan over medium to high heat, then gradually pour in the sugar and leave for a few minutes to melt. Heat the double cream in another pan, so that it doesn’t cause the caramel to seize when it’s added. Add the honey or glucose and butter to the caramel as soon as it turns a reddish brown colour, but be careful not to let it burn. Stir and then add the cream a little at a time, stirring all the while. As soon as this has been well mixed, leave to cool. Cream the butter and sugars until light and fluffy. Add the golden syrup and beat some more. Beat in the eggs one by one, adding a little of the flour in between each one to prevent curdling. Sieve in the dry ingredients alternately with the coffee and vineger, stirring lightly until all is combined. Divide the mixture between two 9″ round silicone moulds or lined tins. Bake at 180C for about 35 minutes or until well risen and a skewer inserted into the middle comes out clean. Leave to cool for ten minutes, then turn out onto wire racks to cool completely. Melt the chocolate in a bowl over hot water then leave to cool a little. Beat the salted butter with the muscovado sugar until all os incorporated. Beat in the cream cheese. Sift in half of the icing sugar to ensure there are no lumps, and beat. Repeat with the remaining icing sugar. Beat in the milk, 1 tbsp of the salted caramel followed by the chocolate and whip vigourously until light and airy. Sandwich the cakes with half of the whipped chocolate and spread the rest on top. 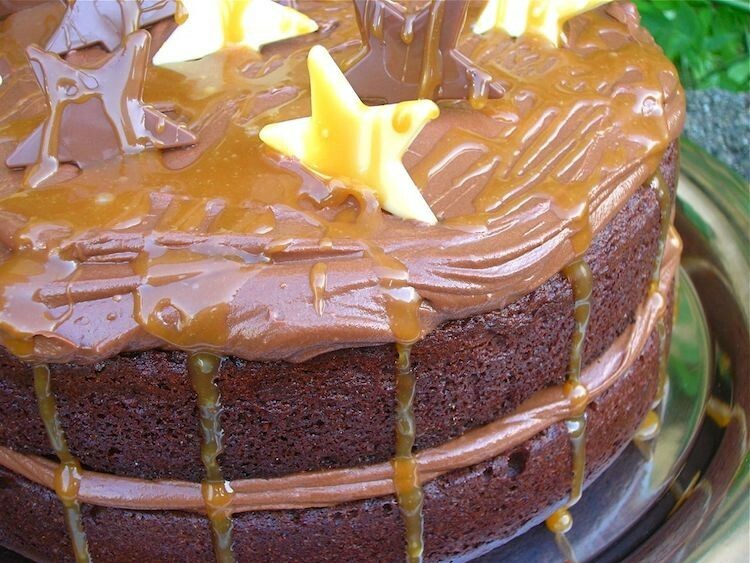 Decorate with chocolate stars then drizzle the caramel over the top allowing it to pool and run down the sides. As I used local eggs and local flour, I am sharing this salted caramel chocolate cake with Shop Local over at Elizabeth’s Kitchen Diary. The wholemeal flour is both grown and milled locally at Cotehele Mill and the duck eggs come from a local smallholding as does the honey. 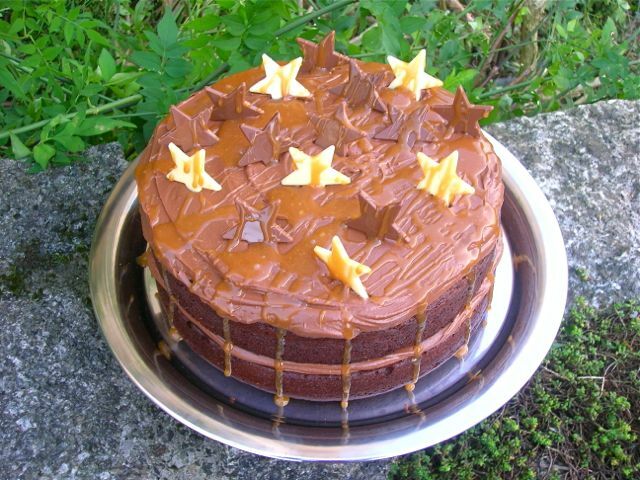 And this chocolate salted caramel cake also seems like a suitable post to share with Bake of the Week over at Casa Costella. Oh my it looks heavenly! I adore salted caramel, so much more than regular caramel! I had to google mesquite powder as its a new one on me – I think I need some in my life! Thanks Anne, I’m with you on the caramel front. I’ve been using mesquite for a while and it just adds a little touch of caramel. Choclette, that looks gorgeous and sounds perfectly scrummy! I love caramel. Thank Jean – it’s the sort of thing that appeals to just about anybody I reckon. That looks amazing Choclette. I’d be happy to tuck into that. Like now! Thank you. Let me know how you get on if you ever do try it. This sounds so delicious, love salted caramel. Your recipe seems easy enough to follow and your photo of the finished cake looks perfect. Thanks Lorna, it’s amazing what a difference a bit of salt make. Wish I had the opportunity to try this cake, it looks delicious! Hmm, yes – have to say the cake didn’t come in at under a fiver. Lush cake! What a shame you didn’t get to try it…… It looks divine. Especially the salted caramel dripping down the sides. I would have been thrilled to have this made for my birthday. Nice job! You and me both Kate 😉 Thanks for your lovely comment, you are always so supportive. Thanks Katie, that was just the effect I was hoping for – something screaming indulgence. Bake one more, so you can get to try it…but don’t forget to invite all of us, Choclette :-)) The cake looks heavenly. Now that really would be fun Angie. I’d love to bake a cake for a bloggers party and get to try out some of their fabulous creations. Wow! I don’t know how you could bear to part with that cake. Please make another one and invite us all around to sample! Would love to Ros 🙂 Was wondering if I could get an I out of it for Alpha Bakes, but I suspect icing isn’t allowed! Thanks CC – strange how tastes continue to evolve. That looks truly amazing. When I move I will just have to try baking again! You will indeed Fiona – none of this can’t bake, won’t bake nonsense! Thanks Helen – didn’t really feel I could hand it over with a bite taken out! What a wonderfully extravagant birthday cake! I have a birthday coming up – fancy making this for me? 🙂 Thank you for sharing with Shop Local! Oh it would make a fabulous birthday cake for your birthday Elizabeth.